Captain Cyrus Drake watched out the front viewport as the UAS Maverick flew past the large gas giants on the outer reaches of the Maravilla system in Sector 32. As the ship passed passed into the system’s habitable zone, the planet Paso came into view. As Anya brought the ship in, Cyrus activated the ship-wide comms. “Alright boys, get that cargo ready to unload; we’ll be docking momentarily.” The captain then stood up and headed to the cargo bay. Stepping into the large open space at the back of the ship, Cyrus was greeted by the sight of his crew moving crates, preparing them to offload on the station. Axel and Taraka were moving one of the larger crates … and then there was Ace. The robotic being was doing just fine moving a fully loaded large crate all by himself. It had been about a month since the Maverick crew had uncovered that ancient construct in Sector 34. Cyrus was surprised how quickly Erik had been able to repair it, and even more surprised that he was able to activate it at all. The most surprising thing, however, was that it appeared to house a fully functional AI. It could have been worth a lot of money, but Erik had insisted that they keep their discovery secret. Erik insisted that Ace, as he had taken to calling the ancient bot, was a sentient being and selling it — or him, rather — would be inhumane. Erik did have a point; Ace would surely wind up in the hands of scientists who would want to study him. As one of the captain’s oldest friends, Erik had his trust, and he had agreed to his wishes. Ace, for his part, still remained an enigma. It seemed that his memory core was too badly damaged and he had no memory of who he was or how he was created. Since he didn’t have anywhere else to go, Cyrus had offered him a place as part of the Maverick’s crew, and he had eagerly accepted. Over the past several weeks, Ace had proved to be a hard worker, and Cyrus was glad for that fact. “How we doing, boys?” Cyrus asked his crew. “Things are proceeding smoothly, Captain,” Ace answered, turning to face Cyrus. “You are such a pessimist,” Cyrus teased the mercenary. “Don’t you think this is taking a bit too long?” Axel asked impatiently. They had been waiting for what seemed like an unusually long time, and the mercenary was eager to get his money. “But not this long,” Axel replied. “Yeah, whatever …” Axel folded his arms and leaned against the wall. “They better get their asses moving,” he added under his breath. This was getting ridiculous. “Sorry, sir, but I’m afraid I’m going to have to ask you to come with us,” one of the soldiers said. “What for?” Axel asked apprehensively. “Is there a problem?” Cyrus asked, approaching the three men. “Damn right, there’s a problem,” the other soldier said. “You’re all under arrest for the transport and attempted sale of spice. “Excuse me?” Axel asked. He looked over at Cyrus, who appeared just as confused as he felt. The next few seconds seemed to pass in slow motion as the soldiers drew their weapons. Axel jumped backwards and threw out a Pokeball, releasing his charmander, then dove behind a crate to avoid incoming fire. “Ritsu, use Ember!” Axel commanded his Pokemon. The Charmander spat out a jet of flames at the soldiers, but they dove out the way. One of the soldiers sprang back to his feet, then dove at Axel, tackling him to the ground. Thinking quickly, Axel pushed the soldier off of him, then rolled over on top of him pinning him to the ground. He then looked up to see the others moving in to engage the other soldier, who had released a Loudred. 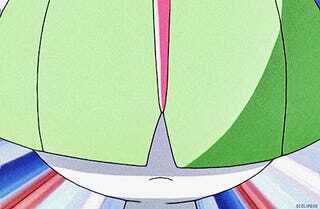 Taraka threw up a reflective psionic barrier around himself and the rest of the crew, while Ace released his Ralts. “Blade, Disarming Voice,” Ace ordered his Pokemon. The Ralts approached the other soldier and emitted a high-pitched wail as he unleashed a burst of energy. “Loudred, Bite!” the soldier shouted in response. His Pokemon charged at Ace. The Loudred’s teeth closed around Ace’s arm, but were repelled by the psionic barrier. Feeling the Federation soldier struggling beneath him, Axel pulled him into a headlock. “Ritsu, Ember again!” He commanded his Pokemon. As the Charmander spit out another lick of flame, Axel pushed the soldier away, forcing him into the fire while shielding himself. The mercenary immediately followed up with a fireball from his flamethrower. The shot hit the soldier directly in the back, erupting in an explosion of fire. “I request that you be more careful,” Ace said as the flames grazed him. Before the mercenary got the chance to take stock of the situation, the remaining soldier opened fire on him, landing a laser shot right on his shoulder. Axel let out a guttural grunt as his shoulder erupted in pain. “Axel!” Ace shouted as he rushed over to the injured mercenary. Ace nodded, then turned to face the remaining soldier. “Blade, Confusion,” he commanded his Pokemon, before bending down to grab the rifle out of the hands of the unconscious soldier by his feet. He then took cover by a nearby crate while his Ralts had the soldier suppressed. Taraka then threw up another psionic barrier around the crew and their Pokemon before releasing his own. “Sirius, use Fairy Wind on that Loudred!” the monk commanded his Togetic as she emerged from her ball. “Loudred, Bite!” the soldier commanded in response to this new threat as his Pokemon was blasted with a powerful gust of air. The Loudred leapt at the Togetic, but its teeth were once again repelled by Taraka’s psionic barrier. “Axel get back, you’re hurt!” Axel suddenly heard Cyrus shout. He turned to see his captain opening fire with his pistol to keep him covered. Axel nodded and began making his way toward cover. “Ritsu, use Flame Burst!” he commanded his Charmander. The orange fire lizard spit out a jet of flame to cover her trainer, taking down the Loudred in the process. Axel cracked a grin as he neared the crate Ace was hiding behind, but it didn’t last very long. Just before he could duck into cover, the Federation soldier landed another shot. Fortunately, Taraka’s psionic barrier helped mitigate the damage. That didn’t mean it still didn’t hurt like hell, however. The mercenary let out a grunt of pain as he slumped against the crate, safely out of the line of fire. “Are you alright?” Ace asked. “Right.” Ace peered over the crate, then began lining up a shot with his newly acquired rifle. “Blade, Confusion!” he then shouted. Axel poked his head out to see Ace’s Ralts blast the soldier with a powerful blast of psychic energy, knocking him off his feet. Ace then immediately followed up with a well-placed shot. “Ritsu, finish him off!” Axel shouted. 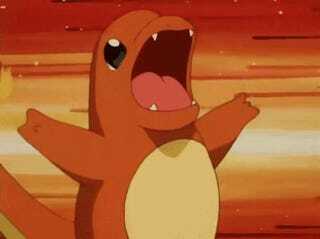 “Use Ember!” His Charmander obliged and unleashed another rush of flame, taking the soldier out. Axel breathed out a sigh of relief. It was done. “I strongly recommend we get off this station before more show up,” Ace said. “Agreed,” the captain said. “We can figure out what the hell just happened once we get out of here. Let’s just hope they didn’t lock our ship down.” He walked over and, with Ace’s help, pulled Axel to his feet. The crew rushed back to the Maverick and quickly boarded the ship. “Anya, get us out of here!” Cyrus yelled into the comms as soon as they were aboard. “Where to?” came the pilot’s reply. Axel breathed a sigh of relief as the Maverick detached from the station without any trouble. He was glad to have gotten away … but there was still one problem. The mercenary turned to look at Cyrus and half-jokingly asked his question. Notes: And so, we’ve arrived at the first session recording, and already we have mishaps! So, uh, I totally forgot to record right at the start of the session, so the first 30-45 minutes were missing. Luckily, I was able to piece together the beginning of the encounter from the rest of the recording, and I was already planning on adding stuff to the beginning of the chapter, so it still came together nicely. 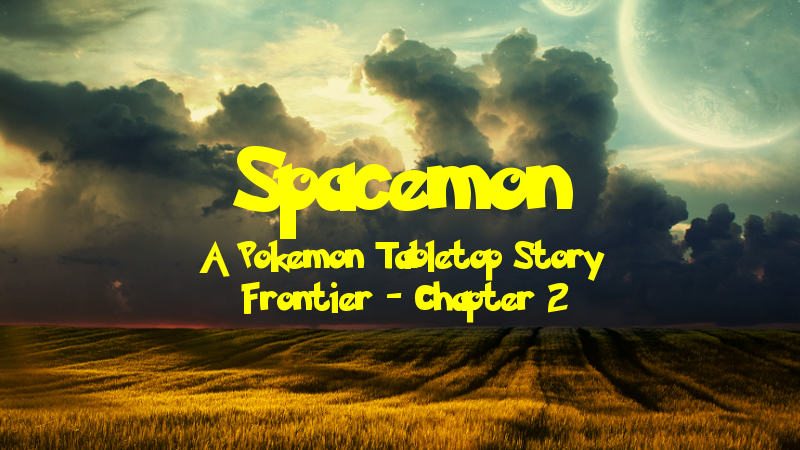 I think the main reason I forgot is that, unlike the original Spacemon campaign, this one wasn’t played in person. It was played online over Roll20. Additionally, I was using a new method of recording since it wasn’t an in person game. I was lazy though and didn’t take the time to iron out some issues with OBS, so these first few recordings are audio only. Later on, I was able to start recording the Roll20 screen as well, which will certainly help with adding more detail to chapters. We’ve got a bit of a time gap from the previous chapter since I felt like it made everything flow better to reveal some details via characters thinking and remembering things instead of directly showing them to readers. This chapter formally introduces us to Ace, the third PC rounding out the party. While he was the focus of the first chapter, he had only one line, but now he’s part of the crew! We also get to meet the last member of the NPC crew, Anya Chan, the Maverick’s pilot. I felt like it was a good idea to give the players a pilot for the ship right from the get go instead of having one of them fly it like we had to do for the start of the original campaign. Getting into the meat of the chapter, this covers the first hour of what I actually recorded, so probably about half the session if you factor in the beginning of the session that didn’t get recorded. I’m still trying to learn how to GM better, so it was great to finally be GMing a campaign that neither DragonStorm or The Other Guy were players in since they are my primary sources of GMing advice. DragonStorm suggested this opening plot hook and I felt like it was a good way to start things off and send the party on the run! What actually happened? Well, the next chapter will shed some light on that. Post-Chapter Challenge: Remember these? Little challenges at the end of some chapters? Let’s get your narrative muscles flexing again. In the spirit of this campaign’s start, it’s your turn to come up with your own rag-tag band of space explorers traveling the Rim. Come up with a ship and a few characters to be its crew! As of this posting, the campaign is still ongoing, so if I like what I see, maybe your ship and crew will get to make a cameo!